Posted byMei 5 November, 2014 14 October, 2014 6 Comments on Children Food Sensitivities – Allergic, Intolerant or Hyper? Each week is a different concept de-mystified, so let’s get started! Kids Food Sensitivities – What is Sensitivity? Food Allergy and Food Intolerance – both have similar symptoms but the cause and treatment is different, which is why it is important to differentiate the two. 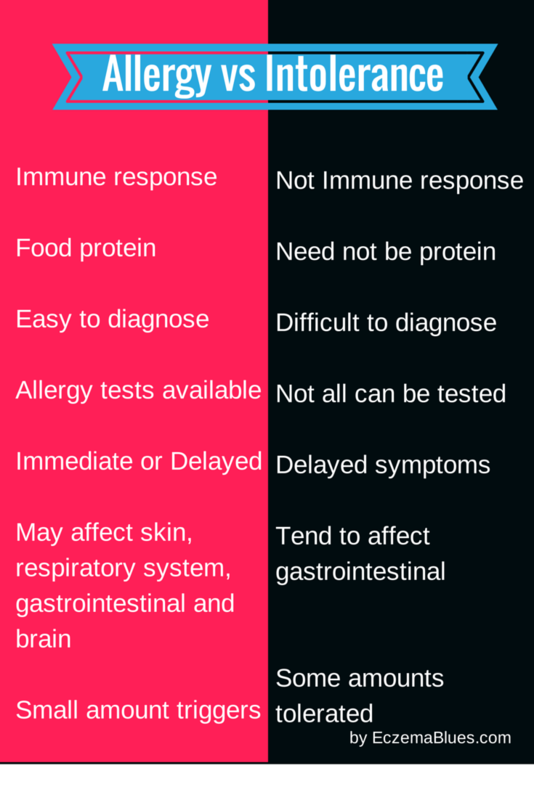 As seen above, there are distinct differences between food allergy and food intolerance although the symptoms of both are similar. However, to be concerned that there is indeed a food sensitivity issue, there has to be a reproducible reaction with the food – i.e. not referring to a one-time stomach upset after eating prawns in the past year (that might be food poisoning!). The diagnosis of food intolerance is generally difficult, except for lack of digestive enzymes lactase, frutase and sucrase. The lack of the digestive enzymes result in lactose, fructose and sucrose not being broken down and result in pain, bloating, spasm and diarrhea. Even stress or anxiety associated with a certain food can cause an intolerance.On the other hand, symptoms such as swelling are closely associated with allergic reaction. For those in Singapore, it is interesting that fish isn’t on our list of common food allergens possibly due to it being so much part of our diet. Birds’ nest on the other hand is given as ‘tonic’ to children early and may actually trigger an allergy! Treatment wise – for both food allergy and food intolerance, avoidance is key. For food allergy, children can undergo another allergy test to see if they have ‘outgrown’ it. For food intolerance which usually does not result in fatal reaction, small amounts of food can be re-introduced in different forms to see which form/amount can be tolerated. There is no cure for allergy or intolerance; however, for certain food intolerance, enzyme supplements can be taken beforehand to digest the food to be ingested e.g. lactose. Here’s a graphic for recap! I just came across your blog from a post on twitter. I had terrible eczema as a child and recurring as an adult. Two years ago I was diagnosed with gluten sensitivity and possible celiac disease. When I stopped eating gluten, my eczema healed. Please see my story on my blog. I hope this helps you. Thanks for sharing this! There’s increasing research in this area and I truly hope to see doctors figuring out the link between intolerance, gluten and eczema more – it would help so many people to have more clarity on this! I’m so glad you’re covering this. It’s very important for everyone to know the difference. And it’s important to give food intolerances more exposure. We focus so much on food allergies, but intolerances can cause a lot of long term damage if not addressed and removed from the diet. It’s difficult though because sensitivity and intolerance are still widely used interchangeably because there is no governming body that makes a clear definition between the two. Food allergy is the only one that is clearly defined. Thanks Jennifer for dropping by! Yes, as I read up about it, I can see why it’s confusing + very difficult to study esp how it affects other body functions or the immune system. It’s very complicated and keeping fingers crossed that more research will give clarity! This is a really great post and a great differentiation of allergy vs intolerance. My son for example is allergic to dairy and everyone always thinks he’s lactose intolerant. He’s had allergy tests that confirm it is an allergy, plus he has broken out in hives before which is not a classic intolerance reaction. He has a cousin that is lactose intolerant though. Thanks Amanda! Yes, it can be complicated esp when one person can also have both food allergy and intolerance to the same foods, though the mechanism for triggering is different.